I'm no marine biologist, but I'm pretty dang sure that fish don't have pig faces. There are hogfish and pigfish. But little pig eyes? Pointy pig ears? Nah. That's bunk. Call it a hunch. Yet, this photo has become a hot topic on uber popular Chinese bulletin board, TT.mop. 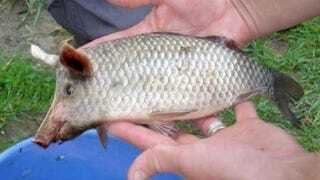 With river pollution a serious problem, some on TT.mop wondered if this fish was a mutation. Others thought it looked like Photoshop. Others? Sorry, I meant smart people. Whoever caught this pig-faced fish, should trade notes with the guy who sliced open the dragon he caught. Photoshop notes. That actually isn't necessary. The image *seems* to have first emerged on parody site An Aspiring Mekubal on February 21. It didn't hit TT.mop until a few days later. You can read an update An Aspiring Mekubal did on pigfish, if you like.